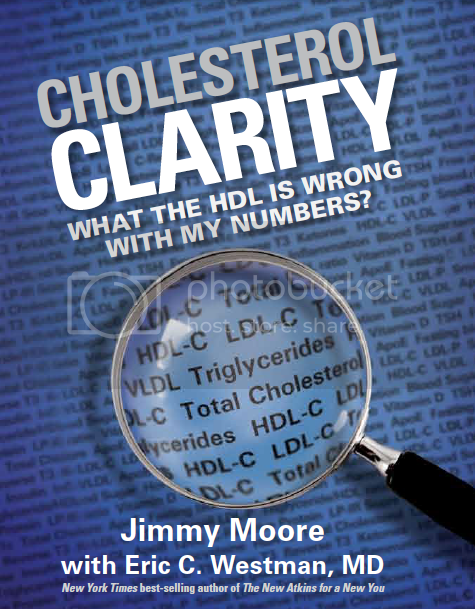 After the momentous international release of Jimmy Moore's debut Victory Belt Publishing book with Dr. Eric Westman entitled Cholesterol Clarity: What The HDL Is Wrong With My Numbers? last week, excitement is in the air about the subject of cholesterol from a very different perspective than what you typically hear from mainstream health sources. Rather than focusing almost exclusively on total and LDL cholesterol to determine your risk for heart disease, this new book contains direct input from 29 bona fide cholesterol, nutrition and health experts--and the message is already resonating with readers around the world as evidenced by the #1 ranking on the Amazon Hot New Releases Nutrition category in the United States, Canada, France, Austria/Germany and even in Japan! People are hungry to know the truth about "what the HDL" is going on with cholesterol and now there's a solid, easy-to-read resource to learn more about this important subject and recommend to others who are looking for real answers based on the latest science. We've enjoyed sharing the raw audio footage from some of Jimmy's exclusive interviews with the experts featured in his book over the past couple of weeks on "The Livin' La Vida Low-Carb Show," including Dr. Dwight Lundell, Dr. Cate Shanahan, Dr. Jeffry Gerber, Dr. John Briffa, Dr. Philip Blair, and Dr. William Davis. All of these incredible physicians shared some truly remarkable information from their vast wealth of knowledge on the subject of cholesterol. This final week of Cholesterol Clarity interviews includes three spectacular conversations that Jimmy had with non-MD experts who had plenty of top-notch things to share about cholesterol that we know you're gonna love and enjoy. We'd love to share all 29 of the audio footage from the experts featured in the "Moment of Clarity" quotes sprinkled throughout the book, but you can see what they had to say when you get a copy of Cholesterol Clarity. Today's expert interview guest is no stranger to those of you who follow all of Jimmy's podcasts--she's Licensed, Registered Dietitian Cassie Bjork, aka Dietitian Cassie. She is the vibrant and enthusiastic co-host on "Low-Carb Conversations with Jimmy Moore & Friends" airing on Fridays and she sees clients every single day who are obsessed with and worried about their cholesterol levels. Listen in as Jimmy and Cassie talk about what's wrong with people being told to eat less fat and more carbohydrates in their diet for their heart health, how she teaches her clients about healthy fats and proteins and the right kind of carbohydrates, the battle she has trying to unbrainwash the misinformation that is being put out there by medical doctors and more! Enjoy this enlightened RD's perspective on cholesterol and health. And if you haven't gotten your copy of Cholesterol Clarity yet (whatcha waitin' for? ), it's now back in stock in hardback at Amazon.com (the Kindle e-book version available as well) and at your local Barnes & Noble bookstore (or in the Nook e-book version). - Listen to Cassie on "Low-Carb Conversations"